The montane forests, low-land rainforests and oil-palm plantations of Africa shelter and feed wild African grey parrots. In their native habitat, the 13-inch tall, hook-billed parrot dines on fruits and berries plucked from tree-tops. Seeds and nuts round out the birds' natural diet. Some other foods common in Western kitchens can be fatal. Excessive preening, lack of appetite, shallow breathing and death can occur after the bird eats avocado. Small amounts of this toxic fruit will cause severe illness, according to WebVet online. Chocolate contains the chemical theobromine. If African grey parrots consume chocolate, the theobromine will cause the bird to have dark feces, act hyper, vomit, have heart arrhythmia, seizures and eventually die. The most potent type of chocolate, dark, unsweetened baking chocolate, contains up to 16 percent theobromine, according to veterinarian Blake Hawley's article "Toxicoses in Birds," on the Old World Aviaries website. Keep anything with sale far away from an African grey parrot. 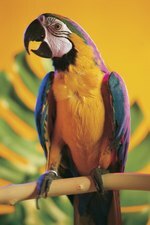 Avoid giving a saltine cracker or potato chip to the pet parrot. Snack crackers, canned vegetables and fast food contain high amounts of added sodium and may actually be toxic to birds, according to Hawley. The African grey parrot may begin drinking larger than normal quantities of water or have runny, watery droppings and go into kidney failure. Avoid poisoning from pesticides and bacteria by offering thoroughly washed and scrubbed organic or home-grown produce to the parrot. Remove pits from all fruits, according to Doctors Foster and Smith's Pet Education website. Moisture causes mold growth on commercially prepared pellet and seed mixes, making them toxic. Visually inspect and smell all feeds before offering them to an African grey parrot. Human treats such as peanut butter, low-quality peanuts, breads, cheese, meats and grains also may contain mold. African grey parrots cannot tolerate alcohol. Tiny quantities consumed orally, or absorbed through the skin, can cause depression, lack of coordination and vomiting. If the pet tries to fly, death may result from flight injuries. Offer African grey parrots fresh, clear dechlorinated water each day. Tap water supplied by a municipal water treatment plant often contains additives such as fluoride, chlorine and minerals. These substances can make parrots very ill.